Seth M.R. 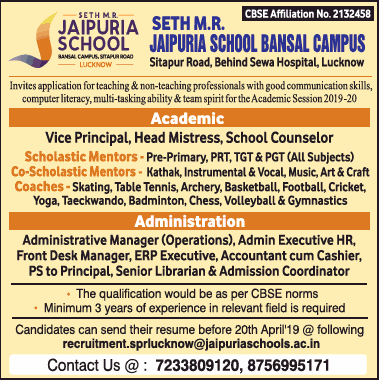 Jaipuria School, Lucknow, Uttar Pradesh advertised in Times of India for the Teachers recruitment 2019 – Teaching Jobs/ Non Teaching Jobs . For More Details see below. About School: Seth M.R. Jaipuria School, Lucknow has been established in memory of Late Seth Mungturam Jaipuria, a great nationalist and doyen of Textile Industry, who was conferred ‘Padma Bhushan’ by the President of India in 1971 in recognition of his services to the society. 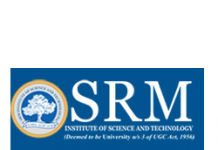 The present patron of the school is Shri Sharad Jaipuria.The school has a vision of a new world in which relationships are governed by the spirit of universal fraternity.The School functions under the guidance and counsel of a galaxy of eminent leaders drawn from the fields of Education, Industry, Science & Technology and under the aegis of the Integral Education Society. The School has been ranked 9th among the top 10 schools of the country according to IMRB- Education World Survey-2007, 2nd in Lucknow and 3rd in UP amongst Best Co-ed day School – Education world 2013, 3rd Best School in U.P. & 2nd in Lucknow – Education world 2015, 2nd Best Co-Ed Day School 2016-17 in U.P. – Education World 2017. How to Apply: Interested and Eligible candidates may send resume to the following address through Email on or before 20th April 2019.